Shower Drain and Bilge Pump. Robust Single Diaphragm Design Sink & Shower Drain Pump. Special diaphragm bilge pump suitable for draining shower and sink. Robust design with single diaphragm and special multi-positional head for universal installation. Thanks to super compact size it can be placed in the lowest points ensuring complete emptying of tanks and eliminating the onset of unpleasant odours. 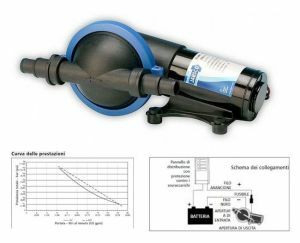 - The Jabsco Shower Drain and Bilge Pump is self priming up to 3m (10ft). - Uses multi positional ports for easy mounting of the pump. - If mounted vertically the motor should be above the pump head. - Use rubber grommets provided to absorb vibration. - Use 19mm (3/4") i.d. spiral reinforced hose (with a smooth internal bore), or semi-rigid pipework systems. - Connect the hose to inlet and outlet of pump using two stainless steel hose clamps at both ends. - All suction connections must be airtight and free of sharp bends or restrictions. Check all electrical connections periodically, particularly in salt water areas. Corrosion can cause loss of performance or non-operation in extreme cases. The motor should be protected with a corrosion inhibiting spray and any rust should be removed and the motor repainted. - Make all electrical connections in dry locations; connections in humid environments should be sealed to prevent corrosion. - Protect the circuit with a rated fuse or circuit breaker in the red positive (+) lead as close as possible to the power source. - Connect the black motor wire to the negative (-) battery terminal. - Inadequate voltage at the motor terminals when the pump is running (not less than 10% below rated voltage at full load) due to partially discharged batteries or insufficient cable size may result in blowing fuses, failure to start or poor pump performance.